So a couple of weeks ago I made an order from Crown Brush after seeing many a blogger raving about their make up brushes. They have a huge range of brushes at really affordable prices, they're not cheap ones but not at all expensive, just fairly priced. The prices of the brushes I purchased ranged from about £3 for the smaller ones up to around £10 for the largest. I've been using these since they arrived and have been really enjoying them. Duo fiber brush: This brush took me a fair few days to actually start using it, purely because it's so pretty. It's so soft and bright white I didn't want to get make up on it, silly considering it's a make up brush but hey! Eventually, I gave in and used it for a blusher and it felt so so soft on my face. It applies colour really evenly and blends super well. The only downside with this is I would say it doesn't pick up much colour so actually takes a while to build up, but it's perfect for a subtle hint of colour and ensures that you don't end up with patchy clown cheeks! Eyebrow brush: I brought this brush as I like to use powder/eyeshadow in my brows and wanted to get an extra brush to use. I was searching for a stiff, angled brush but when this arrived I did not expect it to be quite as stiff as it is! The bristles are super hard and actually quite rough, you have to be gentle with this brush to avoid scratching yourself. At first I wasn't actually a fan of this brush, however after a few more uses and a bit of getting used to, it's not too bad. Blending/crease brush: This is the first of four eye brushes I purchased from Crown Brush as I was really in need of a few extra ones after getting more into eyeshadow recently. I've been using this for blending my shadows together and it is just perfect and an absolute must have, un-blended eyeshadow is so not attractive. From the badger brush range, this is super soft and blends so easily and does a really good job of it. This can also be used for the crease but i find it better for blending. Blending brush: Another badger blending brush, however a slight different shape. I like to use this when i'm using a highlighting shadow between my brows and the lid to blend it out nicely. Again, this is super soft and does a good job at blending out. All over brush: This is just an essential brush for applying shadow all over the lid. I use this to apply my base shadow and it's really good at packing on a nice amount. I can also use this to apply a highlight colour in the inner corner of the eye. Crease brush: Ahhhh and on to my favourite brush of all. This is 100% my favourite eye brush I have ever used and my favourite of my purchases from Crown Brush. This honestly is just perfect, it's the perfect size to fit into the crease without getting shadow all above the lid and everywhere you don't want it, which for some reason I seem to have problems with. It's rounded at the top which helps to apply it evenly, it packs the perfect amount of shadow and just uh I just love it. Basically, you just need to buy it and see how super duper it is. And that is all 6 brushes I purchased from Crown Brush! I would really recommend trying their brushes, they are such good quality, soft brushes for their price and the range is huge. Whilst some of them are just good essentials to have, some are really amazing. I hope to own more Crown Brush brushes in the future! 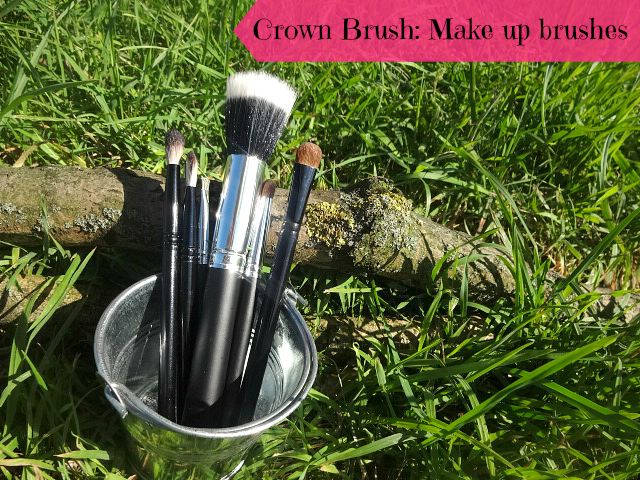 Have you tried Crown Brush? What is your favourite make up brush brand?